Life cycles of the brown garden spider are typical of most spiders. The term brown garden spider may refer to one of many spiders found in gardens throughout the United States. Brown spiders may be web spinners or hunters, but except for the brown recluse spider found in the southwestern United States, are harmless to people. They catch many insects in the garden, however, that can harm plants. Spiders provide a great benefit for the home garden. 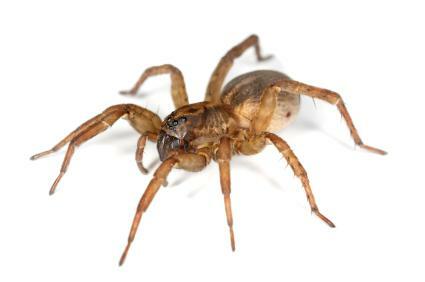 Without seeing a picture of the exact spider, any one of a number of spiders may be called a brown garden spider. Brown spiders found in the garden may be web weavers or hunters. Web weaving brown spiders may weave typical maze-like webs strung between plants or create intricate funnels. Like all spiders, brown web weaving spiders prey upon insects. They capture them in their webs, wrap them up, and eat them. Gardeners often encounter the wolf spider, a large brown spider found in the average garden throughout the temperate United States. These frightening-looking spiders are quite harmless, although they may indeed seem to attack you if you disturb them among rocks or plants in the garden. They're large, hairy, and jump or leap at prey. Almost all brown garden spiders go through a similar life cycle. Life cycles of the brown garden spider follow a cyclical pattern. Fall: Most garden spiders find a mate, mate, and lay their eggs in the fall. They may lay their eggs among fallen leaves, under logs or tree limbs or among garden plants. Egg sacs may be white or gray colored and are secured by silken threads. Winter: Egg sacs remain dormant. If found by hungry animals, they may be eaten or disturbed. Spring: Those eggs sacs that survive the winter begin to hatch. Young spiders are called spiderlings. Some may hatch over the winter or even in the fall and seek shelter through the cold weather. When the spiderlings hatch, they crawl or float to a new location using spider-silk parachutes. They set up housekeeping in a suitable location, spinning webs, catching food and growing to maturity. Summer: Spiders feast upon insects captured in their webs or captured through hunting. After growing to maturity, males seek females and mate. The female seeks a place to lay her eggs, and the cycle is complete. Wolf spiders and other hunting spiders may have a slightly different life cycle. For example, wolf spider mothers carry their egg sacs on their backs. The egg sacs may be as large as pearls or marbles and vary in color from white to a beautiful turquoise color. The mother uses spider silk to attach the sac to her back. When wolf spiderlings hatch, they climb onto the mother's back and hitch a ride around with her until they either tumble off or are mature enough to hunt on their own. It's not uncommon in rural areas to spot a large, tarantula-sized brown wolf spider scurrying across the street with a teeming mass of baby spiders clinging to her back. With so many species of spiders, you may want specific information on life cycles of the brown garden spider that you have in your backyard. The first step is to identify the exact type of spider that you have. Take a photograph of it or bring a good insect identification guide out to the garden to compare it to photographs. Then, look at some of the following university and Cooperative Extension websites to find out more, or take the photos to your local Cooperative Extension office for identification. Whatever you do, don't kill the spider. Brown garden spiders are harmless and can eat many so-called bad bugs throughout the growing season, thus reducing pests that can harm your garden plants. Encyclopedia of Life information and details on the life cycle of the garden spider. University of Wisconsin article on garden spiders.